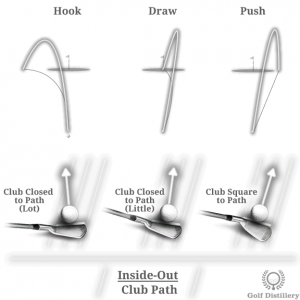 The way the golf club crosses the target line at impact – as well as before and after – is defined as the swing path and it can vary across three different types. They are explained below. 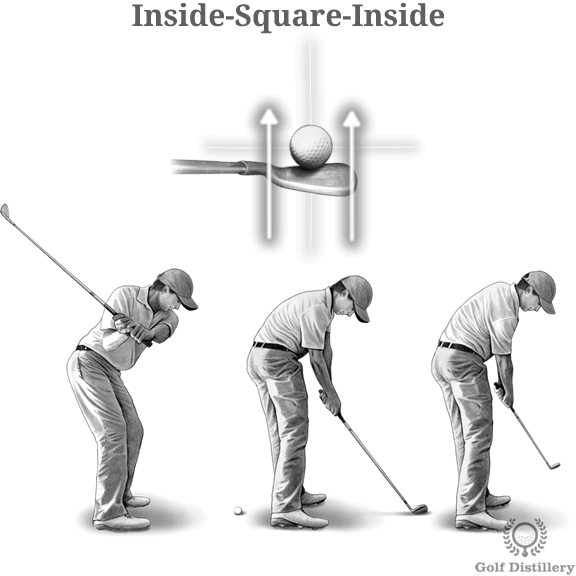 The inside-square-inside swing path is fundamentally a straight swing path as it naturally follows the restrictions set by your body as it is positioned relative to the ball. 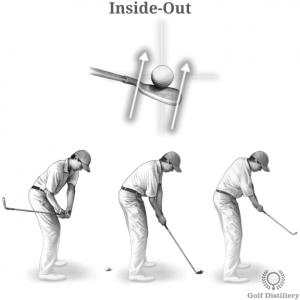 Indeed, during the takeaway and backswing, the clubhead will naturally be brought inside the target line so that it can rotate around the central axis of your body. During the downswing your body will uncoil and the club will follow a similar path until it will reach the ball at impact and intersect with the target line for the only time in the entire swing. Finally, after impact the club will be brought back inside the target line as it continues following its natural path around your body. 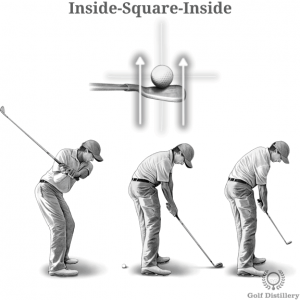 Provided that your clubhead strikes the ball in a square position relative to the target – perpendicular to the target line – an inside-square-inside swing path will deliver a straight shot at the target. Actually, a square swing path is the only way a ball can fly to the target without the help of any sidespin. 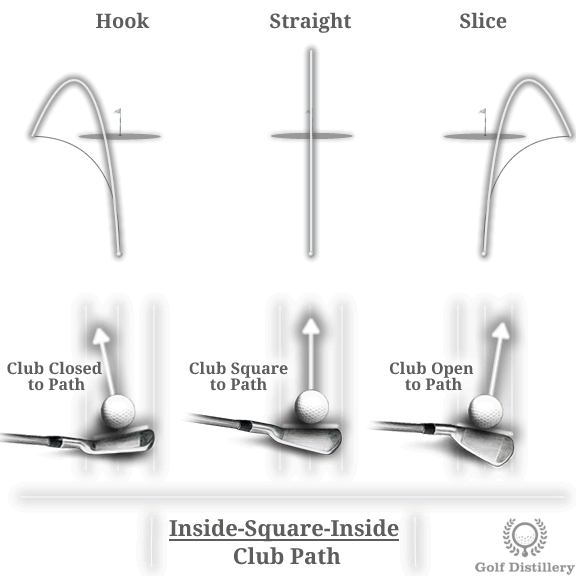 An inside-square-inside swing path will only create a straight shot with minimal sidespin if the clubface hits the ball in a square position. 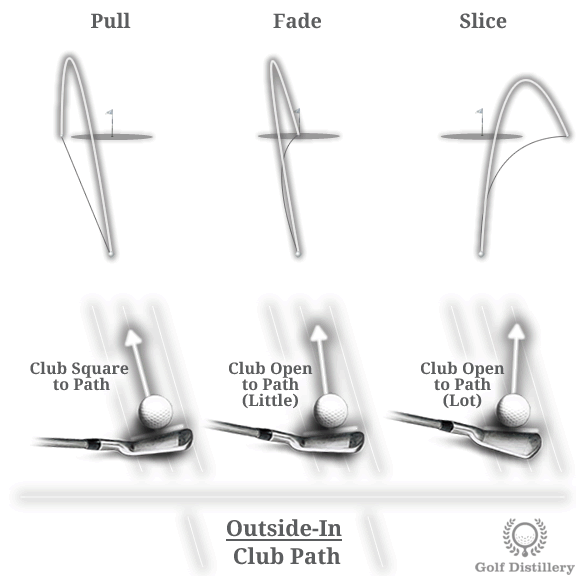 A closed clubface will produce a hook – right to left sidespin – while an open clubface will produce a slice – left to right sidespin. The outside-in swing path will see the clubhead move outside of the target line right after address, during the takeaway and backswing. It will cross that line at impact and follow its course inside during the follow through. Basically, this is a type of swing path that is aimed left of the target. It is also often referred to as an over the top. 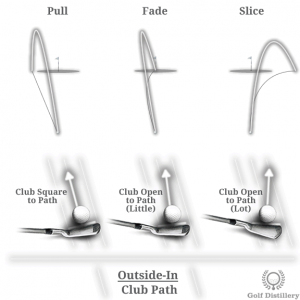 Such a swing path is closely associated with slices as the club cuts the ball at impact. Indeed, depending on how the clubface is positioned at impact left to right side spin will naturally be transferred onto the ball. 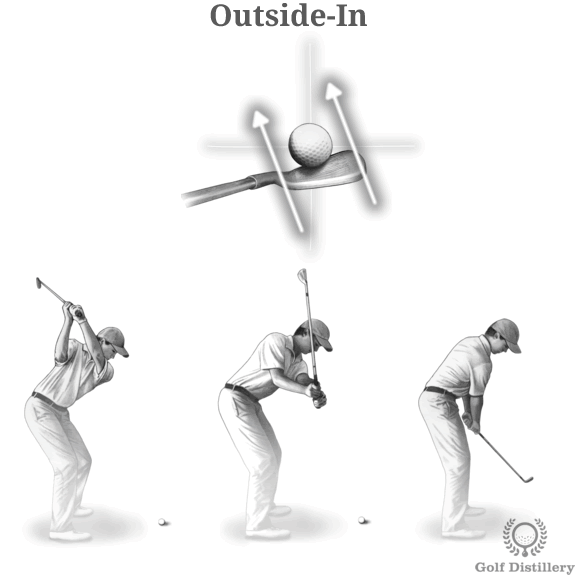 If the angle of the clubface matches the angle of the swing path at impact then the ball will shoot straight forward. However, because an outside-in swing will be aimed to the left of the target, this combination of factors will produce a pulled shot, i.e., a straight shot to the left of the target. If the angle of the clubface is closed (aimed to the left) relative to the target line but open relative to the swing path then you will likely produce a shot that will fade towards the target. Finally, if the angle of the clubface is open relative to the target line and open still to the swing path then you will likely produce a shot that will slice away from the target. The inside-out swing path will see the clubhead move inside of the target line right after address, during the takeaway and backswing. 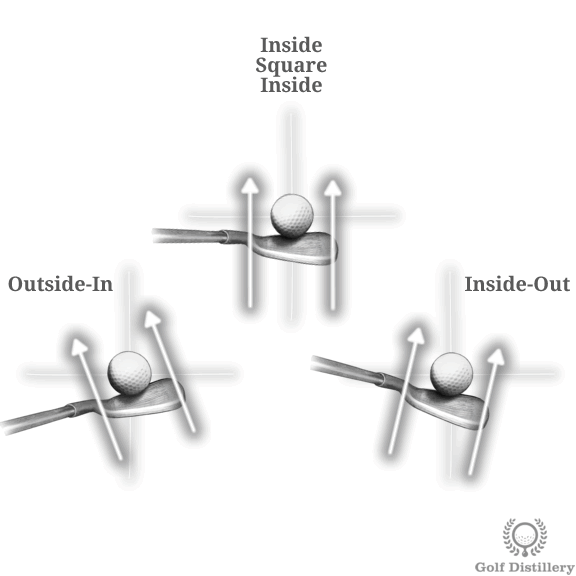 However, it will have been brought too far inside, which will result in the clubhead crossing the target line at impact and continuing outside of it during the first stages of the follow through, rather than be brought back inside. Basically, this is a type of swing path that is aimed right of the target. 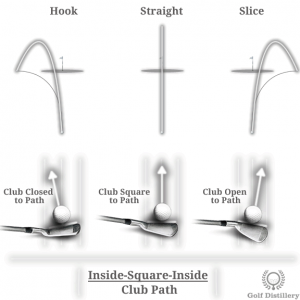 Such a swing path is closely associated with hooks as the club will cut the ball at impact. Indeed, depending on how the clubface is positioned at impact right to left spin will naturally be transferred onto the ball. If the angle of the clubface matches the angle of the swing path at impact then the ball will shoot straight forward. However, because the inside-out swing will be aimed to the right of the target, this combination of factors will produce a pushed shot, i.e., a straight shot to the right of the target. 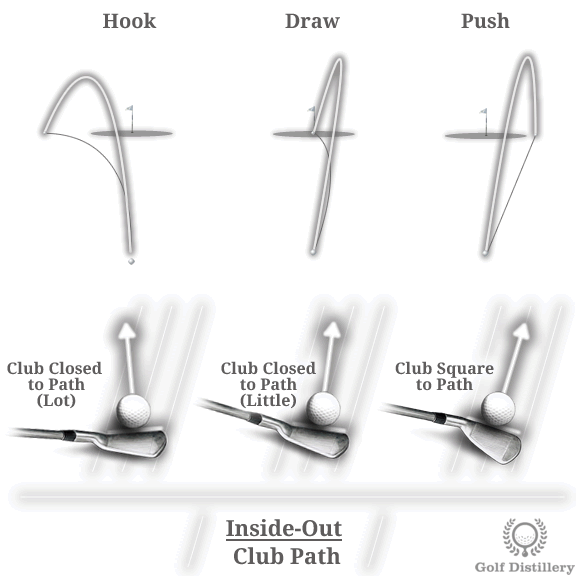 If the angle of the club is close to the swing path but open to the target line then you will likely produce a shot that will draw towards the target. Finally, if the angle of the clubface is closed relative to the target line and open still relative to the swing path then you will likely produce a shot that will hook away from the target.